Internet Download Manager is used for downloading files, documents, media and movies from the Internet. 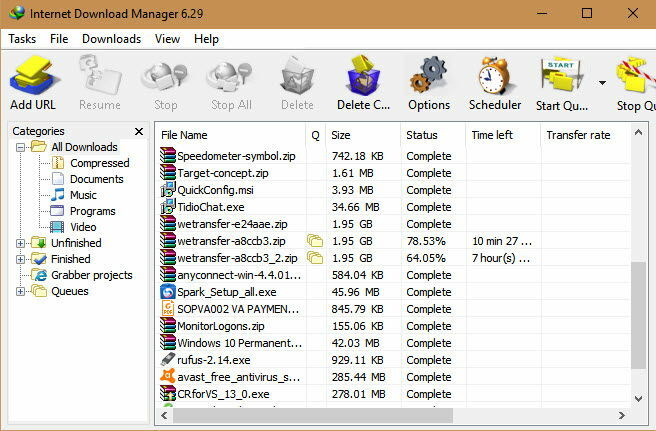 IDM is known as one of the best download manager. Due to its stability and optimized performance, it has a large number of users. You can even schedule your download with IDM. It provides 4 times faster downloading than usual downloads. You can pause or resume your downloads to avoid any interruption or any internet issues. The new version of IDM 6.28 build 9 is available for users to download. It is released on 2nd May 2017. Download it from below offline installer link and enjoy the offline installation of it on your System. IDM provides 4 times faster speed than usual downloads. It has integration support on almost every browser. You can schedule your downloads if you have a plan to start any downloads after any specific time period. Pause and resume option will not let your downloading files, stop or interrupt. Its interface is simple and easy to use. The virus scanner will scan virus in any downloading files and tell you about it if found any threat or virus. In the History section of IDM, you can see all your downloaded history. This will help you to track your old downloaded program if you need it again. You can drag and drop any file in IDM to start downloading. It is available in many languages. You can use IDM in your own preferred language. IDM is a video grabber. Any web page is having video, IDM will pop-up a message “Download this video”. No major changes have made in this version. An issue has been fixed related to Firefox browser. And no other error or security issue was reported in the previous version of IDM build 8. The problem with erroneous interceptions of files in Firefox is fixed. Performance is improved and optimized than the earlier version. Download IDM from below link. Run the installer to install the IDM on your System and go ahead with steps to complete the installation. When the installation is done, IDM will automatically integrate with your default browser. You can also integrate it with any other browser manually.